The world-at-large associates the brand McAfee with anti-virus computer software, which over the years has become a household name. The software gets its title from the company's founder and creator, John McAfee, who in recent months has been documented in the tech world more for his strange behavior than his tech savvy. After relocating to Belize, McAfee's life reportedly became one of excess, with almost unbelievable accounts of former gang members turned armed guards, rumors of drug use and police corruption, and even allegations of murder. 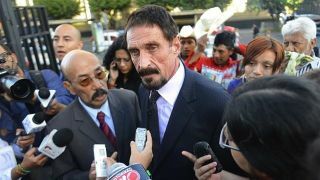 McAfee had fled to Guatemala to avoid the investigation, and had for reasons only known to him invited journalists from Vice to join him in seclusion. As Wired reported, the journalists posted a picture to the web in a blog entitled, "We are with John McAfee right now, suckers," which included metadata police were able to use to track McAfee's location. Thanks to forgetting to scrub the private location data from the image, Guatemalan police were able to capture McAfee, potentially ending one of the most bizarre stories the tech world has ever witnessed. Metadata is hidden away inside all the documents, images and files you've been working on or using on your computer on a regular basis. While it could pertain to the size of the photo, or length of a document, metadata can also include details about who created the file and where and when it was originated. The photograph taken of John McAfee included GPS data, which law enforcement authorities used to ascertain his exact location for capture. Protecting your privacy isn't only for those wishing to evade capture on murder charges. Many people have reasons for wanting to protect their privacy, including, as Mr. McAfee experienced, wanting to keep the location of where a picture was taken off the web. You can avoid the same mistakes attributed to McAfee and those traveling journalists by following a few simple tasks to keep your files as private as possible. First, you can utilize a tool like Metadata Assistant, which allows you to view all the hidden information in a multitude of files (including PDFs and Excel spreadsheets) to determine if there's any unwanted data you want to remove. A program like Doc Scrubber works in almost the same way, and allows you to scrub any metadata you won't want others to see from Microsoft Word documents. Adobe Acrobat has a feature like this already built in, and all you have to do is merely use the "Examine Document" option to scan the file you're currently working on. It's also possible to do the same to images with software like JPEG and PNG Stripper, which will not only remove all the hidden data, but also reduce the file size of the applicable picture. QuickFix works the same way, and gives you the option to erase GPS data and personal metadata from an image with just one simple click. While you probably won't have to worry about potentially evading arrest, these tips should at least give you some ease of mind when it comes to how much people can find out about you based on your computer files.